Kshama Sawant is among candidates leading their races in the Seattle City Council’s first election with district voting in more than 100 years. 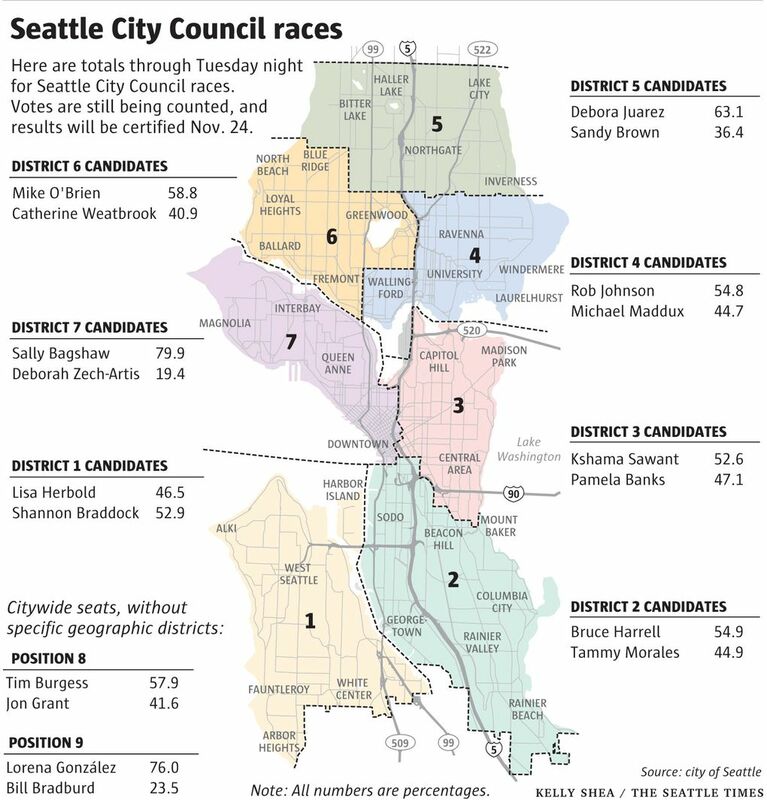 All five Seattle City Council members seeking re-election were ahead in their races in first-day returns, with leads ranging from Sally Bagshaw’s 61 percentage points to Kshama Sawant’s 6 points. Tuesday’s general election was the council’s first in more than a century with voting by geographic district. Votes will continue being counted until certification Nov. 24. Bagshaw (District 7), Debora Juarez (District 5) and Lorena González (Position 9) will win their races. Also leading were Shannon Braddock (District 1), Bruce Harrell (District 2), Rob Johnson (District 4), Mike O’Brien (District 6) and Tim Burgess (Position 8). Sawant is in District 3. Burgess and González are seeking the council’s remaining two citywide seats. Sawant called Tuesday’s returns “a strong victory for all working people, for the socialist movement.” She cautioned her followers that the night’s results were just “the first drop,” but that she expects her lead to grow as more ballots are counted. Each of the council’s nine members previously represented the whole city, under a system in use since 1911. But Seattle voters approved a ballot measure in 2013 moving seven of those nine seats to voting by district, starting with the 2015 election. The new council will include at least four new members, because four races include no current members, and will be majority female. Two current council members, Nick Licata and Tom Rasmussen, didn’t seek re-election. Current Councilmember John Okamoto also didn’t run. He was appointed in April as a temporary replacement for Councilmember Sally Clark, who had resigned. Councilmember Jean Godden’s re-election bid ended in the District 4 primary. Proponents of district voting hoped the change would make council campaigns less expensive and encourage more people to run. They were pleased when 47 candidates made the primary-election ballot. The top two vote-getters in each race advanced. District-voting proponents also argued the new system would push candidates and council members to pay more attention to neighborhood-level concerns. Most candidates spent time knocking on doors and chatting with regular voters, and some made neighborhood-specific matters central to their campaigns. North Seattle voters will have a council member as a neighbor for the first time in many years because District 5 covers most of the city above 85th Street. But broader issues also received considerable attention as Tuesday drew near, even in the district races. Seattle’s struggles with housing affordability, in particular, were spotlighted, as candidates warred over how to address rising rents and how to pay for those policies. Component post 9810793 could not be found. One group, including Tammy Morales (District 2), Sawant, Michael Maddux (District 4) and Jon Grant (Position 8) and to some extent Lisa Herbold (District 1), O’Brien and Bill Bradburd (Position 9), staked out ground on the political left of their rivals. They embraced the possibility of Seattle adopting some form of rent control and enacting a tax on the wealthy, and they took aim at real-estate developers. Others, including Braddock, Harrell, Banks, Johnson, Burgess and González, described themselves as political progressives while assuring voters they would maintain working relationships with corporate leaders. The surprise twist of the election year was a historic amount of money poured into several races by independent-expenditure committees. The committees, which have no contribution limits and which are barred from coordinating with candidates, spent more than $787,000. They spent about $7,000 in 2013, zero in 2011 and about $135,000 in 2009. The largest committee was United for Tim, which dumped more than $219,000 into the Position 8 race to support Burgess. Braddock, Banks and Johnson were beneficiaries of independent money, as well, mostly bankrolled by business groups. Union-backed committees spent for Sawant and Grant, and Native American tribes for Juarez, a member of Blackfeet Nation. The committee that garnered the most headlines spent nothing at all, though. Seattle Needs Ethical Leaders was caught up in scandal when a Triad Capital Partners executive told Grant he would help make the committee planning to spend against Grant “go away” in return for Grant’s help settling a lawsuit against the firm. Grant publicized the proposal after the executive spelled it out in a text message, and the fallout included Mayor Ed Murray vowing to cut Triad out of a project. Sawant raised more money than any other candidate, pulling in more than $441,000. Banks raised more than $384,000, much of it from people in the real-estate, financial and hospitality industries determined to defeat Sawant. The new council will wrangle with numerous pieces of proposed legislation related to Murray’s housing agenda, built on recommendations by a citizens task force. It will also keep tabs on Seattle’s minimum-wage law, passed last year, which put all workers in the city on a path to at least $15 an hour. The new group will be younger and more diverse than the current one. Licata, Rasmussen and Okamoto are all men over 60.